I use an Olympus u-tough 2010 model in a housing. I know it has limitations but I like it because it does not dominate my diving and being waterproof is not subject to flooding, but I would like to know if the newer models Olympus TG1 or TG2 are an improvement and worth upgrading to? Or are there any other waterproof compact cameras that can be used with housing that someone could recommend? 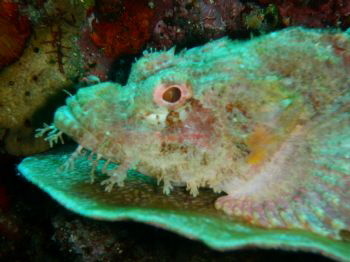 Hers a photos I recently took with my Olympus tough of a scorpionfish at Bunaken island, Indonesia.